Sustainable fabrics are not restricted to bamboo and hemp. An innovative range of sportswear is now being made out of old coffee grounds. Most of us need that caffeine jolt to kick-start us into the day. But how many of us, over a quick cup of coffee, would think about spinning our latte on a lathe and turning it into a top? Jason Chen, the general manager of the Taiwanese Singtex Industrial Company, had a brainwave as he was sipping coffee in – where else? – Starbucks. Most coffee grounds end up in landfill, but Singtex is now collecting waste grounds from the drinks giant to turn into sportswear. 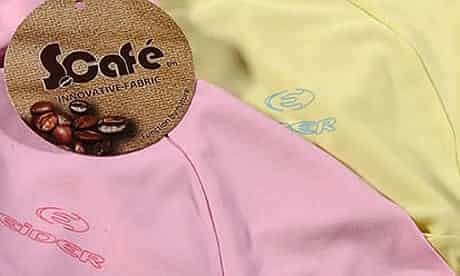 The process of making fabric out of coffee grounds is very similar to that used to turn bamboo into a viscose-like material. The resultant fabric is soft, light, flexible and breathable and can also be used to produce an outer shell that is water resistant. It’s impregnated with ‘activated’ carbon, derived from coconut, which makes it UV-resistant, wicks water away, keeps the wearer cool and binds to sweat to eliminate unpleasant odours. Singtex says the fabric is perfect for mid and base layers for adrenalin-powered sports like rock climbing, as well as walking, running and yoga. Apparently, it only takes the grounds from one cup of coffee to make enough material for a couple of T-shirts. Singtex already makes performance sportswear out of recycled plastic bottles, as does Patagonia, the first outdoor clothing company to begin the practice in 1993. Since then, Patagonia claims to have rescued 92m bottles of pop from the tip. As plastic is oil-derived, the company has saved enough oil to fill a gas-guzzling 40-gallon Chelsea tractor 20,000 times over. Another innovative fabric that is currently being trialled is spun from nettles. The common stinging nettle was used to produce textiles for thousands of years, until people switched to cotton in the 15th century. Now cotton’s reputation has turned sour thanks to reports of the child labour used to pick it, not to mention the vast amounts of water and tonnes of herbicides, pesticides and fertilizers required by the crop. Stinging nettles can easily be grown sustainably, organically and with little water – in fact, as most gardeners know, they hardly need any encouragement at all. Camira Fabrics, based in Yorkshire, has been working for the past four years with Defra on a fabric made from nettles and has now produced a range called Stingplus. It’s a tough textile primarily created for bus and car seats. Nettle can be turned into finer fabrics too, with a texture like linen. It has the ability to wick moisture away from the body as well as keeping the wearer cool and trapping warm air, plus being naturally anti-bacterial and mould-resistant. Brennels, a Dutch fashion label, has started growing its own nettles in eastern Europe and has brought out a range of smart-casual clothes made from the fabric. And in the Himalayas, the giant nettle, allo, is being spun by local communities to create a fair trade, eco-friendly fabric.